Dr. Kunihisa Soda, Commissioner of NSC, chaired the meeting and the discussion was carried out about the Development of the Infrastructures for Ensuring Nuclear Safety among senior officials and experts in charge of nuclear policy and nuclear safety regulation of nine FNCA member countries, that is, Bangladesh, China, Indonesia, Japan, Korea, Malaysia, The Philippines, Thailand and Vietnam. An officer of the Department of Nuclear Safety and Security, IAEA, also participated in the meeting. 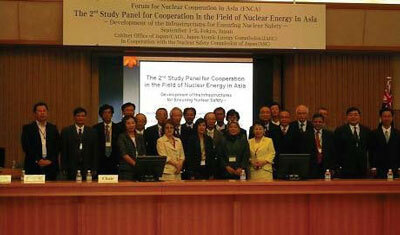 Based on the recognition that promoting international cooperation can contribute to effective and efficient development of the infrastructure for nuclear safety, it was suggested that it is necessary to share the knowledge and experiences among FNCA countries and to promote coordination of FNCA with other international frameworks such as Asian Nuclear Safety Network (ANSN) in IAEA and sub-network of nuclear safety of Association of South East Asian Nations (ASEAN) + 3 (Japan, China, Korea), etc. 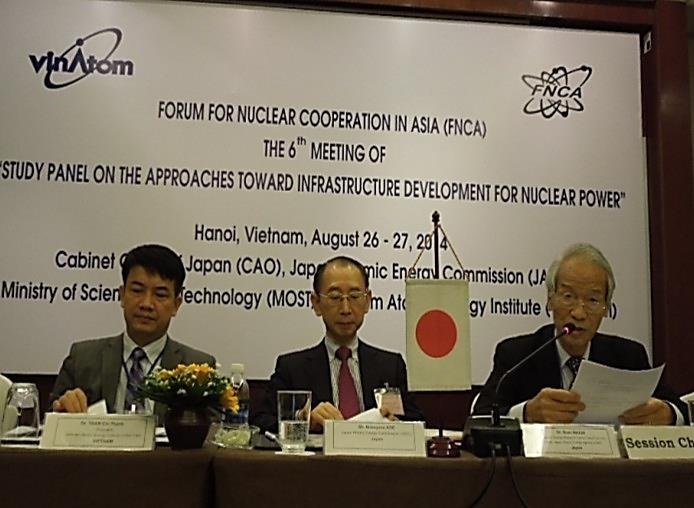 *1 In view of the recent movement toward introduction of nuclear power in the region, FNCA has been holding the study panel for the past five years on the role of nuclear energy in Asia and on the cooperation for promoting nuclear energy. The panel was held for three years as the first phase and subsequently for two years as the second phase, This present meeting is the last one year of the second phase. In the welcome address, Prof. Shunsuke Kondo, Chairman of Japan Atomic Energy Commission (JAEC), stated that he strongly hopes the cooperation among FNCA countries in the field of nuclear safety through sharing experiences by exchanging opinions on nuclear safety regulations in this meeting. Following the address, participants introduced themselves. Members of each country reported the situation of nuclear power utilization and future plan, and the situations and issues on development of the infrastructures for ensuring nuclear safety in their respective countries. The National Energy Policy 2008,approves the construction plan of nuclear power plant and a small or medium size reactor is scheduled to be completed by 2020. Bangladesh Atomic Energy Commission (BAEC) is responsible for the promotion of nuclear power and for nuclear safety regulations. Nuclear Safety and Radiation Control Division (NSRCD) is in charge of nuclear safety regulations and development of the infrastructures for fundamental safety regulations on the nuclear power. The issues such as separation of promotion and regulation, and further development of the infrastructures, with the support of international cooperation will be taken up. At present, 11 nuclear power units with nine GWe in total are operating and eight units are under construction. China plans to increase nuclear power to 40 GWe, that is, four percent of total electricity generation by 2020. National Nuclear Safety Administration (NNSA) is in charge of nuclear safety regulation and under NNSA, Nuclear Safety Center has been set up as a technical support organization. For the increase of nuclear power in the near future, further enhancement of human resource and other infrastructures are proceeding. Based on the National Nuclear Energy Program (PENN), the first nuclear power plants (two 1000 Mw plants) will be operable in 2016 or 2017. In the nuclear field, two organizations, National Nuclear Energy Agency (BATAN) and Nuclear Energy Regulatory Agency (BAPETEN) located under the President. BATAN is in charge of promoting nuclear power and BAPETEN is in charge of nuclear safety regulation. Further development of infrastructure for the safety of nuclear power, such as introducing regulations for emergency preparedness and human resource development is being carried out. At present, 55 nuclear power units, are operating generating 49.6 GWe per annum.This accounts for 25.4% of total electricity generation in 2007. Now three plants are under construction. Nuclear Safety Commission (NSC) is responsible for the overall control of the nuclear safety regulation. Nuclear and Industrial Safety Agency (NISA) is in charge of the safety regulation of commercial nuclear power plants and Ministry of Education, Culture, Sports, Science and Technology (MEXT) is in charge of research reactors safety. NISA executes safety regulation, scientific and rational judgment. Transparency and neutrality is the code of conduct of NISA. At present, 20 nuclear power units, are in operation generating 17.7 GWe per annum. Six units under construction and two units in the planning process will be completed by 2016 and total output capacity will be increased to 22.5 GWe. Further increase of nuclear power is planned and it is expected to account for 60% of total electricity generation in 2030. Concerning the nuclear safety regulation, Nuclear Safety Commission (NSC) in the Ministry of Education, Science and Technology (MEST) makes basic policy and a division of MEST executes the policy. 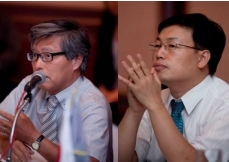 Korea Institute of Nuclear Safety (KINS) assists them as a technical support organization. For enhancement of human resource development, nuclear safety school was established in 2004 under KINS. At present, there is no plan to introduce nuclear power. But considering the depleting indigenous fossil fuel resources, the introduction of nuclear power after 2020 is being studied. This August, the Prime Minister stated that a study will be carried out whether nuclear power can be added into one of the renewable (alternative) energy resources on which Malaysia puts greater importance. Malaysian Nuclear Agency (MNA) is in charge of research and development and Atomic Energy Licensing Board (AELB) is in charge of nuclear safety regulation. Legal systems for nuclear power safety, standards and guidelines and other infrastructure are being developed. Human resources are also being developed through on the job training using the existing research reactor. In the 1970s, the Philippines launched its first nuclear power project with the construction of the 620 MWe-Bataan Nuclear Power Plant (BNPP) which was nearly completed. However, the project was cancelled due to change of the government policy in 1986, being influenced by the Chernobyl accident. Presently, the Department of Energy is considering nuclear power as one of the long-term energy options after 2022. With this in view, the Philippine government requested for an IAEA review mission in January 2008 to advise on a) the possibility of rehabilitating the Bataan plant, and b) on the requisite national infrastructure for launching a nuclear power program. In consideration of the IAEA recommendations, the Department of Energy (DOE) and the Department of Science and Technology (DOST) are creating an inter-agency Core Group to address the possible rehabilitation of the BNPP and the national infrastructure needed for a nuclear power program, and provide recommendations to the Philippine Government on the nuclear option. The Philippine Nuclear Research Institute of the DOST is in charge of nuclear safety regulation. It has initiated the development of a new law to create an independent nuclear regulatory body which is now under consideration by the Philippine Congress. The Thai Power Development Plan 2007 - 2021, states that four nuclear power units of two GWe will be in operation in 2020 and also two GWe in 2021. The decision will be made on the introduction of the nuclear power by the cabinet by 2011. 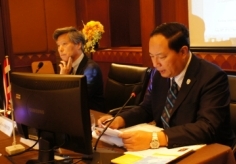 Thai Atomic Energy Commission (AEC) which is in charge of nuclear policy develops the principles for nuclear safety regulation and Office of Atoms for Peace (OAP) under Ministry of Science and Technology (MOST) puts them into effect. Studies will be conducted on the infrastructure development of nuclear power safety, such as establishment of independent organizations, development of legal system and human resources development. On the 23rd July 2007, the Prime Minister of Viet Nam approved the Master Plan for Implementation of the Strategy for Peaceful Utilization of Atomic Energy up to the year 2020. The Master Plan consists of 23 projects covering all aspects necessary for ensuring sustainable atomic energy development in Viet Nam. After that, on the 27th December 2007, the Prime Minister approved the National Strategy for Energy Development up to 2020 and vision to 2050, which promotes nuclear power with the objective that up to 2050, nuclear power will be accounting for 15-20% of total electric power generation. Regarding to the legal aspect, on the 3rd June 2008, the National Assembly adopted the Atomic Energy Law, which will come into force on the 1st January 2009. The Law regulates the safe, secured, and peaceful uses of atomic energy, including participation in and implementation of international nuclear treaties, and the strengthening of international cooperation. The Pre-FS on Construction of the two NPPs with total capacity of 4,000 MW (2 sites x 2 units x 1,000 MW) is being at the finalizing stage. According to the Pre-FS, the first nuclear power unit will be put into commercial operation by the years 2020-2021. While the Vietnam Agency for Radiation and Nuclear Safety (VARANS) is in charge of nuclear safety regulation, Vietnam Atomic Energy Commission (VAEC) in collaboration with relevant organizations has been studying on development of infrastructure for the Project on Construction of Nuclear Power Plants in Viet Nam, of which the infrastructures of the safety regulations for nuclear power is being built such as formulating standards and criteria, human resources, and the establishment of technical support organization (TSO). The following four presentations were given on the development of the infrastructures for ensuring safety of nuclear power plant. Activities of Nuclear and Industry Safety Agency (NISA) responsible for nuclear safety regulation in Japan were introduced. They were i) improvement of regulatory activities including enhancement of public information and public hearing activities, ii) enhancement of safety regulation for the design review step, iii) improvement of safety regulation for management of aging plants, iv) enhancement of infrastructures of nuclear safety including technology basis, human resources, etc. and v) enhancement of activities in international cooperation. Also Key-events in 2007 were introduced, e.g. ‘Integrated Regulatory Review Service (IRRS)’to Japan conducted in June 2007 by IAEA, influence of Niigataken Chuetsu-Oki Earthquake on the Kashiwazaki-Kariwa nuclear power plant, re-evaluation of seismic safety, etc. When the nuclear power was first introduced in China, the situation of multi-nation import, multi-type reactor, standards and technology caused the following results, different technology system, operation and management style. At present, the laws of nuclear safety regulations, standards and criteria are being updated to comply with the international standards. A program to evaluate and supervise the quality control was formulated and implemented, starting from the planning phase of new nuclear power units. Human resources development for experts of nuclear safety regulation is actively conducted. As for the international cooperation in safety regulation, China has positively participated in IAEA and other international organizations. Moreover, the construction of nuclear power plant is conducted based on the democratic decision making, hearing the public opinion enough as well as respecting their rights sufficiently. The Outline of Korea Institute of Nuclear Safety (KINS) and International Nuclear Safety School (INSS) established in KINS were presented. KINS is the technical support organization of Ministry of Education, Science and Technology (MEST). Its mission includes monitoring of the nuclear safety related facilities, control of radiation users, monitoring of environmental radioactivity, research and development of safety regulation and management of nuclear safety information. INSS is the educational facility established by KINS in order to train specialists in nuclear safety regulation, where they can learn technology and knowledge on related legislation system. It was explained that it takes at least 10 to 15 years to prepare for the introduction of nuclear power plant including the planning step and that after commencement of operation, about 100 years' commitment is needed until decommissioning, therefore each country must take responsibility to ensure nuclear safety all through this period. IAEA activities for ensuring nuclear safety were introduced. They are i) publication of reference materials such as the milestone document as guidelines to infrastructure development for introducing nuclear power plant ii) introduction of the international standards such as the safety standards series iii) review of legislation for safety regulation, of technology on nuclear safety and of safety culture in each country (IRRS) iv) providing materials for instruction and educational course for human resources development of nuclear safety,v) providing knowledge and information of nuclear safety using Asian Nuclear Safety Network (ANSN). Also it was stated that there is a possibility to promote activities of cooperation more effectively by collaborating with FNCA and ASNS, such as information exchange in FNCA by utilizing IT network constructed by ANSN, etc. Discussion was held on how international cooperation in FNCA should be promoted to develop infrastructures for ensuring nuclear safety. In the lead speech, an overview of nuclear power utilization, planning and situation of nuclear safety regulation in each country was given based on the country reports, followed by exchanging opinions on necessary cooperation, its method, goals and objectives, etc. concerning the infrastructures development for ensuring nuclear safety. Legal system, human resources development including technical competence and public hearing / relations are among the most important activities of international cooperation. It is important to share information and experiences between countries already utilizing nuclear power and countries introducing nuclear power, and an effective means would be to hold seminars and/or workshops for that purpose. IAEA guidelines are useful for infrastructure development and will be even more so if quantitative index for measuring performance are provided. IAEA Workshops will provide opportunities to work on such index. Cooperation and networking with the existing framework, such as IAEA/ANSN, ASEAN + 3, etc. should be utilized. In conjunction with them, it is necessary to study the ways in order to achieve results effectively. The progress was reported on the development of human resources development (HRD) information database carried out by Japanese secretariat following the decision in the panel meeting, ministerial level meeting and coordinators meeting held in the last fiscal year. This database is a collection of the specifications and the contents of HRD programs for nuclear power in FNCA countries and it will be built on the FNCA web site to be utilized online from member countries. The questionnaire on the configuration, data items and usage of the database was sent to each country and the replies are being received. The programming has just started based on the replies. From now, actual data will be collected through focal points in each country, and assembled into a database. This system will be operable next April. In the discussion, it was commented that this activity was the first concrete result accomplished by the 2nd Phase of study panel, and FNCA countries must positively participate in the activity. Also, it is pointed out that such database has not been built in other international frameworks such as IAEA/ANSN, etc. and therefore is expected to be more useful. Moreover, it was confirmed to continue the effort for improvement, i.e. the enhancement of data contents and items after operation. Data on legislation system for safety regulation in each country was suggested as one example. Active exchange of information, good practices and lessons learned on the infrastructure development such as safety legal system, human resource and public acceptance should be conducted among FNCA countries through seminars and/or workshops. Coordination with other international frameworks such as IAEA/ANSN, ASEAN+3 should be pursued to produce results more effectively. In view of recent demands for energy supply, nuclear power is considered as one of the important options and nuclear safety is an essential element for the use of nuclear power. For countries operating nuclear power plants, nuclear infrastructure for ensuring safety should be established, maintained at the highest level and improved continuously. International cooperation should be pursued and promoted for enhancing nuclear safety more efficiently and effectively. The use of existing international frameworks such as IAEA program, Asian programs, and others in coordinated manner is effective and efficient. FNCA supports national strategy for human resources development including on the job training and technical competence development pursued by member countries. FNCA database for human resources is expected to be instrumental in sharing information as well as identifying important issues. FNCA should continue to work to strengthen international cooperation. Based on the conclusion of this meeting, the FNCA Ministerial Level Meeting is expected to discuss policy issues with regard to development of nuclear power infrastructures. As a result of study panel in the first phase (three years: 2004 - 2006) and the second phase (two years: 2007 - 2008), it was confirmed that the great accomplishment was achieved such as the signing of the joint communiqué ‘on the Peaceful Use of Nuclear Energy for Sustainable Development’ in the eighth FNCA Ministerial Level Meeting held in December, 2007 and the implementation of the FNCA human resources development information database program. 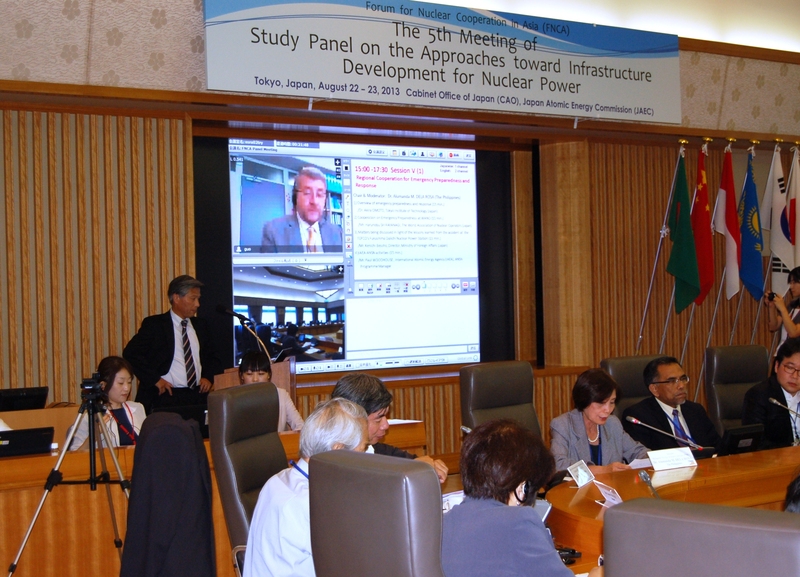 The third phase was proposed to start ‘Study Panel on the Approaches Toward Infrastructure Development for Nuclear Power’ from the next fiscal year (1st April, 2009), aiming at sharing the actual experiences of infrastructures development for nuclear power among senior officials and experts in charge to use such knowledge for promotion of nuclear power in each FNCA country possible international cooperation should be studied. The proposal was accepted. (i) design, construction, operation, and maintenance of nuclear power plant, (ii) fuel supply, (iii) radiation protection (including emergency preparedness), (iv) waste management, (v) public hearing and information (PA), (vi) financing. It was proposed to hold the meeting once or twice annually for two - three years. It was decided to continue the discussion to finalize these details. Dr. Kunihisa Soda, the chairperson, re-presented the draft report to be submitted to the Ninth Ministerial Level Meeting based on the discussion results in Session 6 and it was approved. Then, it was informed from the secretariat that the Ninth Ministerial Level Meeting will be held on November 28th in Manila (Senior Officials Meeting will be held on November 27th) and the tenth FNCA coordinator meeting will be held in February or March in Tokyo. Lastly, in the closing address Dr. Shunichi Tanaka, Vice-Chairman of Japan Atomic Energy Commission, expressed his appreciation for the enthusiastic argument of the participants for two days and stated that continuous cooperation is essential in order to promote nuclear power in Asia and ensuring nuclear safety is a common issue to all FNCA countries.